is just sooo annoying when actually you have been a good girl and done your expenses yesterday. We get lots of support calls from SharePoint Reminder webpart users who have annoyed their team members in just this way – by sending our Reminder emails for tasks that have already been completed. This is easy enough to do. Reminder will look at the whole of a list unless you tell it to do something else. So if you ask Reminder to send out an email for everyone who is tasked to complete their expenses claim form by 12.00 today that is exactly what it will do, regardless of whether the status of that task is “Active” or “Completed”. Some users ask why Reminder doesn’t just work on “Active” tasks by default. There are good reasons for this. For example there may well be occasions when you want to send out reminders on completed tasks. 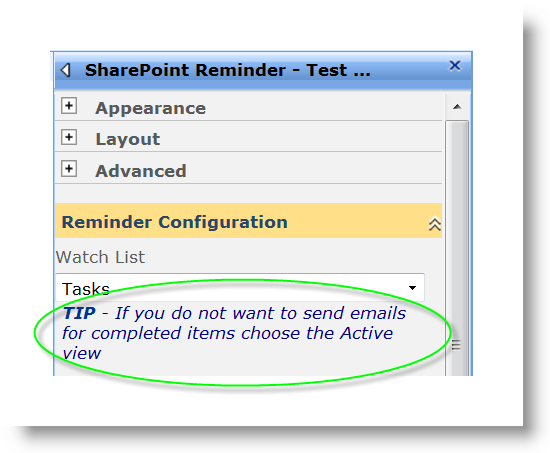 But for those times when sending a reminder for completed items just isn’t appropriate you need to ensure that Reminder is watching the “Active” view of your Task or Issues list, rather than the entire list. This message displays when you ask Reminder to watch the entire task list, and disappears if you select a view. For more information here is the relevant SharePoint Reminder Webpart manual page. Filtering is a really great way to get more out of SharePoint Reminder, once customers start to explore the power of filters they generally come up with a whole host of new ways that Reminder could save them time and trouble. For example you might want to filter on priority, and send a team manager alerts on overdue high priority tasks once a week. For more ideas on using filters take a look at this blog post. You can download the new version of SharePoint Reminder Webpart here. The new version of Reminder is Free of charge to all existing customers and will install directly over the top of your existing version with no disruption to your existing configuration. Please refer to this page for installation instructions. For those of you who are not yet using SharePoint Reminder a fully functional 30 day free trail is available to download here. We hope this is helpful, and is you have any other comments or suggestions please get in touch.